disparaging President Muhammadu Buhari and the congresspersons adminitration he leads. 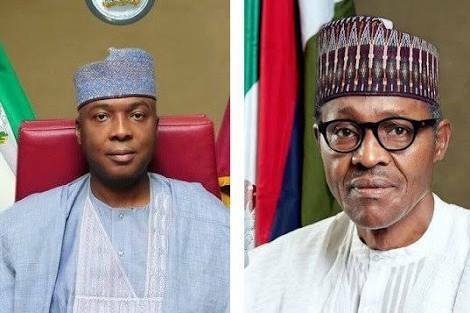 Saraki, who decamped from the APC to pursue his presidential aspiration to secure a ticket of the PDP, described Buhari as lacking the vision and capacity to run the country. dangerous and desperate politician who can do anything to achieve his inordinate ambition. It, however, pleaded with Buhari’s supporters to ignore what it called “Saraki’s crude speeches”. A statement by presidential spokesman Garba Shehu said: “The Presidency wishes to react to the crude speeches hitting the news from Senator Bukola Saraki who recently joined the Peoples Democratic Party with the sole ambition of running for the president of Nigeria. “In response to the condemnable and extremely derogatory speeches by the PDP aspirant, we urge all Buhari supporters to display restraint in language and conduct and to always put across their points of view in a decent language. “Throughout his political career, Senator Saraki has shown that he is a very dangerous person who can go any length to promote his personal interests. “The language of his campaign is such that cannot be used against a domestic help. Is he just knowing that the President lacked vision? This is someone that the Senator had worked with very closely for more than three years. Amazingly, he never said all that he is now saying against him. “Rather, his word for and on the President were always respectful and reassuring. That’s the man he called ‘My Father’. About him, ‘there is no cause for alarm…a President who is healthy, witty and himself.’ What then changed, all of a sudden? “Is he saying these blatantly false and crude things against the President because he is gunning for the same office? Could it be that he is targeting President Buhari because the party he just joined does not have any real issues to highlight? In his search for support, Saraki insisted that the country was in need of a young vibrant leader with the capacity to withstand the rigours of governance at all time.